Second Sunday Fellowship Lunch This Week! Just another reminder that our Second Sunday Fellowship Lunch will be this Sunday! I love you with all my heart, and I can’t wait to see you on the Lord’s Day! Fellowship Lunch: This Sunday, April 14, is our final Second Sunday Lunch Fellowship for the season. We will take a break for the summer months and resume in the fall. Thank you so much for ALL the help with setting up, cooking and bringing food, serving and cleaning up! This month’s menu is Baked Ziti, Salad, Bread, and Dessert. Please makes plans to join us for lunch after worship. Click the link below and sign up if you’d like to bring a dessert, tea, or something for the salad. Church Picnic: It is our tradition to get together for fellowship every spring/summer to eat and celebrate being in a church family. Please join us on Sunday, April 28th from 4 to 7 pm at Monte Sano State Park. The church will provide Lawler’s BBQ, and we plan to have some games (Gaga Ball, Nine Square, etc) set up for all to enjoy. If you haven’t been, there is a large covered pavilion, shade/trees, and a giant playground for the kids. Please pray that the weather is beautiful for us to enjoy! **Feel free to sign up for a side dish or dessert at the following link: https://www.PerfectPotluck.com/OGXC9984 For those coming for dinner only, we will eat at 5:15 pm. If slots are full, or you decide to come last minute, please join us – no need to bring anything. There will be plenty for all to enjoy! HPRC: The Huntsville Pregnancy Resource Center 2019 Fundraising Banquet is Thursday, April 25th, from 6:30-8:30. Come hear Abby Johnson speak and learn how you can support the HPRC. There are a limited number of complimentary tickets. For more information and to reserve your spot, please see Loralee or Clay Davis. Men’s Fellowship Groups: Men’s Lunch Fellowship Groups have formed, but you can still join by signing up in the Narthex. For more information please see Norman Dean. Senior Fellows: On Tuesday, April 16 at 8 AM the Senior Fellows will go fishing at Madison County Lake. Carpools will leave the church at 7:15 AM. Bring the kids and grand kids, and pack a lunch. Youth Group: Youth Group for ages 13-18 meets April 14 at the church at 4:30 PM. 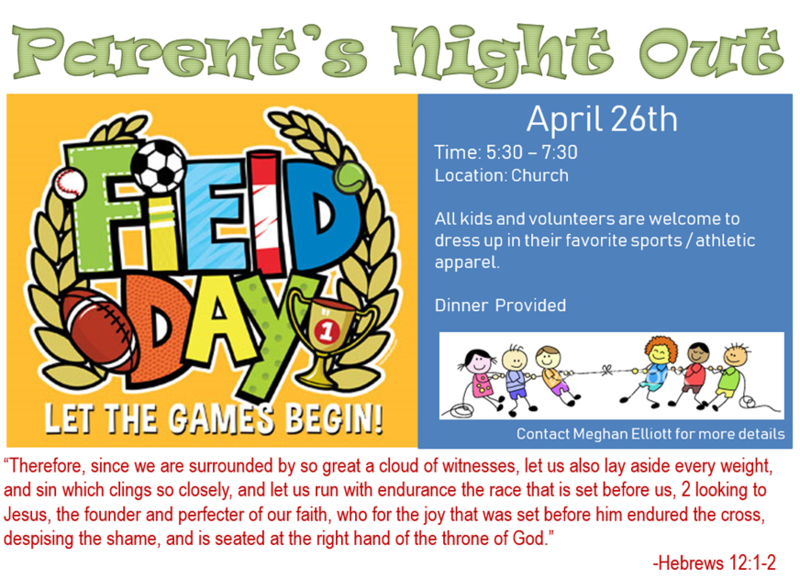 Parents Night Out: We are excited to be having a Parent’s Night Out on Friday, April 26th from 5:30 – 7:30 pm. 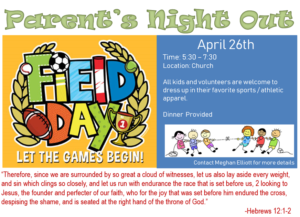 The event is a great time for our children to be together with their church family and will include games, crafts, dinner and short teaching on Christian life from Hebrews 12. We will send out a reminder email closer to the date but please consider participating or volunteering. We will need 12-15 volunteers and it’s a wonderful way for all ages (teen to retired) to get to know the children and serve our parents. Please use this link to VOLUNTEER or RSVP your children: http://evite.me/R1k5weXa8z . Email Meghan directly w/ questions. It’s going to be a BLAST! Healing: Please pray for the health of the following individuals: Clay Davis, Pat Galecki, Bill Cowley, Larrabee Kirkland, Katie Dyer, Chris Smotherman, Elizabeth Holton, Janet Chou, Ramona Edwards, and Nolan Osmer. Expecting: Please pray for the Bryant family, expecting in September.